Laid down by Consolidated Steel, Orange TX April 15 1942. 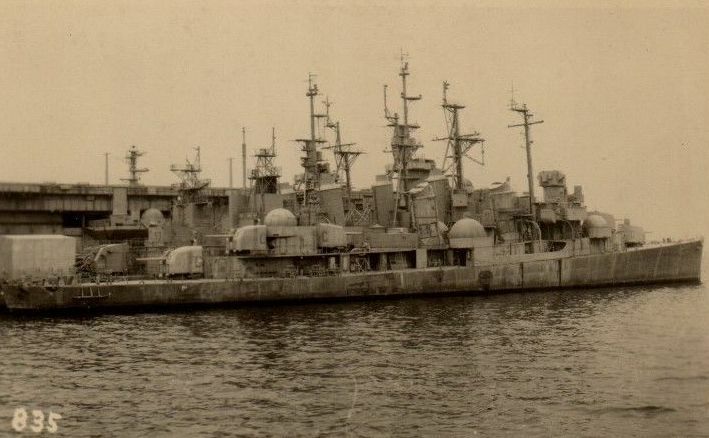 Launched September 13 1942 and commissioned June 16 1943. Fate Sunk as target April 8 1974. "For outstanding heroism in action as a Fighter Direction Ship on Radar Picket station during the Okinawa Campaign, from March 27 to May 15, 1945. 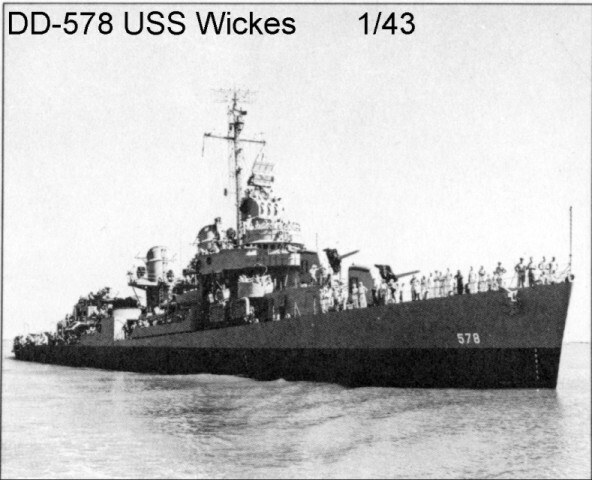 A natural and frequent target for heavy Japanese aerial attack while occupying advanced and isolated stations, the USS WICKES defeated all efforts of enemy Kamikaze and dive-bombing planes to destroy her. 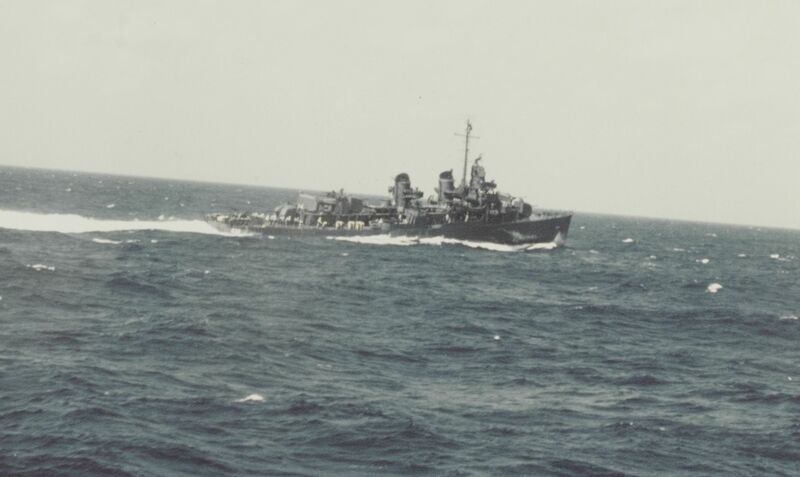 Constantly vigilant and ready for battle, she sent out early air warnings, provided fighter direction, and, with her own gunfire, downed three hostile planes, shared in the destruction of two others, routed many more and rendered valiant service in preventing the Japanese from striking in force the Naval Forces off Okinawa beachheads. A gallant, fighting ship, the WICKES, her officers and men withstood the stress and perils of vital radar picket duty, achieving a distinctive combat record which attests to the teamwork, courage, and skill of her entire company and enhances the finest traditions of the United States Naval Service." All personnel attached to and serving on board the U.S.S. 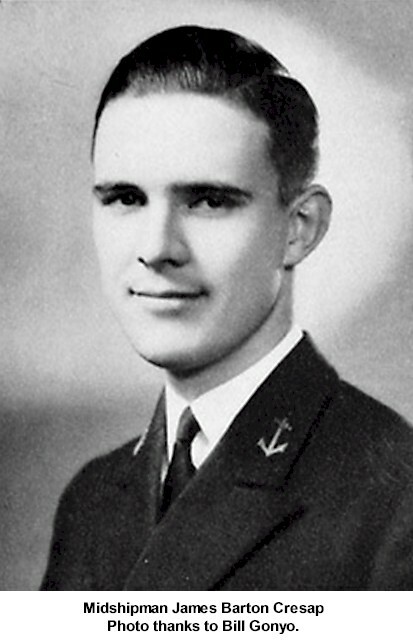 WICKES from March 27 to May 15, 1945 authorized to wear the NAVY UNIT COMMENDATION Ribbon.